Basketball is one of the most popular sports around the world. Millions of children grew up playing the sport and many of them dreamt of playing in the NBA or in the Olympics. Professional players went through years and years of practice and training to get where they are now. For amateurs, however, it only takes a hoop and a ball. In fact, they don’t even need a traditional basketball court to be able to enjoy the sport. This is where the advantage of getting the best in-ground basketball goals comes into play. In this post, we will be discussing everything there is to learn about getting the best in-ground basketball hoops available on the market now. These hoops provide better stability, flexibility, and are stronger in general than portable driveway basketball goals. With so many brands and products to choose from, how do you decide which one to buy? Luckily, we have provided you a rundown of our top seven recommendations for the best ones out there, along with a description of their best features, pros, and cons. Hopefully, you would be able to make an informed decision after reading this post. The basketball system’s support pole is its foundation and the one responsible for the whole hoop’s stability. Cheaper ones include a multi-piece support pole wherein you insert it directly into a 24-inch deep hole with concrete. Installation may be a bit tricky, as you need to ensure that the pole you are installing is perfectly vertical. More expensive hoops, on the other hand, include an anchor kit, which will require you to insert it into a 48-inch hole. When choosing a good basketball hoop, you need to make sure that it offers the support, as well as the stability of your basketball system. In addition, you should also take into consideration the thickness of the support pole, especially if you want a sturdy and stable one. Make sure that the one you choose features a support pole that eliminates any kind of unwanted and unnecessary wobbling. Plus, you also need to consider the height adjustment mechanism the support pole allows. Most of the in-ground hoops on this review can be adjusted from 7.5 feet up to 10 feet. However, there is one that can be lowered all the way down to 5 feet, which would be perfect for your kids and their friends. First off, you should consider the size of the basketball system’s backboard, which may range from 48 inches up to 60 inches. As you may already know, the backboard provides you with enough space for bank shots, as well as layups. If you are a beginner, you might want to consider buying a basketball hoop with its backboard made of lightweight and durable polycarbonate materials. However, if you want a more long-lasting backboard, go for one that is made of tempered glass material. This would be a great investment on your part, as it is strong, hard, scratch-resistant, and has the capability to offer you the best rebound response. All in-ground basketball hoops on this review come with breakaway rims, which make rebounds shorter, as well as dampen the impact of the shots. To add, they are comfortable, especially if you want to hang on it after a groundbreaking dunk. So, make sure that the springs of the breakaway rim are covered with a protective finish to prevent rust, ensuring longer durability. Because of the durability and strength offered by most in-ground basketball hoops, you might realize that some of them are quite expensive. You would not want to spend so much on a basketball hoop, especially if you are only playing the sport occasionally. Luckily, you don’t have to spend much on that, as we have provided you with options that can accommodate your budget. However, if money is not an issue, we do recommend that you get one that is of superior quality. With the Silverback 60-inch in-ground basketball hoop, you will feel like you’re playing indoors. It features a concrete anchor system, which makes the entire system sturdy and secure. This system also minimizes the swaying caused by the wind. In addition, its base can easily be unbolted if you need to move the hoop to another location. 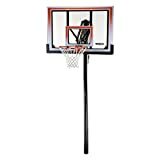 This basketball hoop also comes with a tempered glass backboard, which is equipped with an under-padding and a flexible and durable breakaway rim. Lastly, its DuPont powder-coated pole can be adjusted from 7.5 feet up to 10 feet. The Diamond series created by Pro Dunk offers a high-performance gym-quality in-ground basketball hoop that comes with a 72-inch tempered glass backboard. It is equipped with a massive 12 x 8 pole that allows a rock-solid play. Every purchase of this basketball hoop system includes a complete padding set, pole and gusset padding. The brand also offers a lifetime limited warranty, allowing you to shoot, dunk, and hang on its adjustable pole. Lastly, it boasts its Rust Armor Package, which includes its stainless-steel hardware, its extended corrosion warranty, and the Zinc galvanized system. The Spalding NBA basketball system revolves around its height adjustment capabilities, which is a company-specific lifting system allowing you a range from 7.5 to 10 feet rim height. What’s great about this in-ground basketball system is that instead of providing you with one height, Spalding built several stopping increments into its lifting mechanism. Its 6-inch increments allow you to place its rim at 8 or 9 feet, or even half-foot stops to accommodate every player. 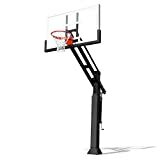 The Lifetime 71524 In-Ground basketball hoop features a 50-inch steel-framed backboard that is equipped with an Action Grip height adjustment mechanism, allowing you to adjust it from 7.5 feet up to 10 feet high in 6-inch increments. 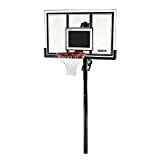 In addition, this basketball system includes a Slam-It Rim that comes with an all-weather nylon net, as well as a 3.5-inch diameter round steel pole. With the Lifetime basketball hoop, you will be able to bring the arena to your home. 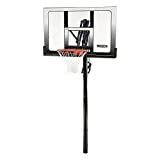 The Lifetime 71281 basketball hoop features a 52-inch shatterproof backboard made of high-density polyethylene and it would only cost you less than $300. This, indeed, is a true bang for your buck considering all its great features. It comes with a stainless-steel pole of 3.5-inch diameter, as well as a friction-weld joint, preventing unnecessary and unwanted movements while promoting stability. In addition, it has the capability to adjust from 7.5 feet up to 10 feet. It is equipped with the Slam-It Rim that allows you to fearlessly dunk without the worry of damaging it. Lastly, it features an all-weather nylon net. Aside from professional and competitive purposes, basketball can also be played for leisure and recreation. To be able to enjoy this game, it would require you a special kind of basketball system like this offering by Lifetime. What makes the Lifetime 71799 basketball hoop one of the best is that both the frame and the pole are made of stainless steel material. In addition, they are further coated with rust and weather-resistant finish, preventing external factors to damage them. Another great feature of the Lifetime 71799 is that it has a reliable rim that will serve you good under the most intense gameplay, all thanks to its sturdy and heavy-duty construction. Indeed, you will never be disappointed if you choose this model. Lastly, it features height adjustment capabilities. Unlike most of the basketball systems on this review, the Pro Dunk Gold can be adjusted all the way down to 5 feet. This feature is what makes it one of the best in-ground basketball hoops, as it allows your children and their friends to play the sport too. With its weight of 470 lbs, it comes in a rock-solid construction, paired with its extraordinary backboard support. It also has one of largest backboards on this review, with its 60-inch tempered glass backboard with a breakaway rim. This feature is vital, as you can dunk securely and safely without you worrying about damaging it. Another reason to consider the Pro Dunk Gold is that is features the Rust Armor, a special coating that effectively battles rust, ensuring that you will be able to enjoy playing for a long period. In addition, it comes with 1-inch padding, as well as an easy access low-hanging handle, which allows easy adjustment. A downside, however, is its weight. With almost 500 lbs of weight, it would not be possible to just move it easily. It may require you to use a hand truck to be able to move it. In addition, we do not recommend self-installation on this basketball system. Now that we have discussed everything there is to learn about choosing the best in-ground basketball systems, it would be now up to you to decide which one gives you great value for your money. As not all basketball systems are created equally, you might need to evaluate a bit more carefully to be able to come up with an intelligent buying decision. Just remember to review each product, as well as weigh its best features, pros, and cons, to determine which one would work out the best for you and your family.